A live Bullhead we found fighting for his life in the mouth of a Largemouth Bass. What’s it eating? In the fishing world, whenever a fish is cleaned for the frying pan, inevitably the curious fisherman will take a few seconds to remove the stomach and see what the fish was eating. Minnows were dinner last night? Time to get out the Rapala. Damselflies and mayflies? Break out the flyrod tomorrow evening. 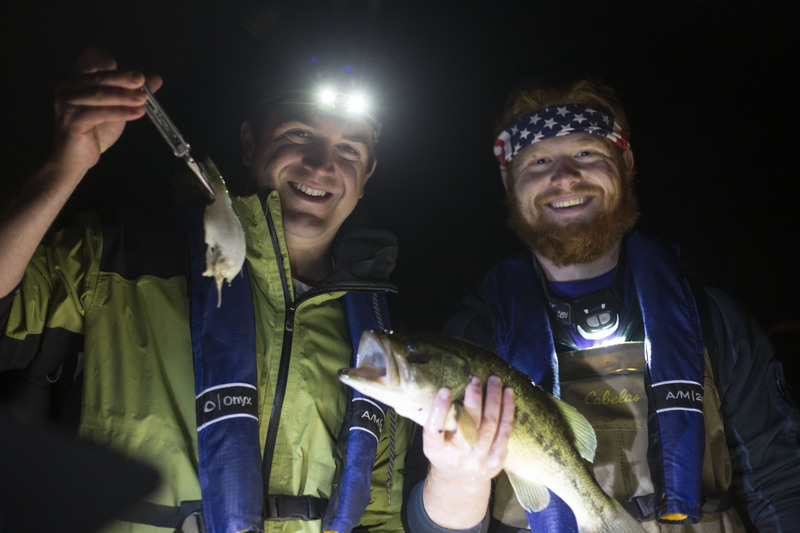 In fisheries research, scientists are also interested in what the fish are eating to better understand their biology and the ecosystem in which they live. How can we see what they ate without dissecting them? We pump their stomachs! Pumping stomachs, otherwise known as a gastric lavage, is one of the most common techniques used to determine what a fish has been eating. It provides easy access to the fish’s gut contents while allowing us to release the fish unharmed (if not a little hungry). The concept behind gastric lavage is simple: place a tube into the back portion of the fish’s stomach and fill the stomach with water. The fish regurgitate their gut contents, which are then collected and saved for later analysis. As you can probably tell from the video below, this technique only works well when the fish are large. Here’s what it looks like when performed correctly. 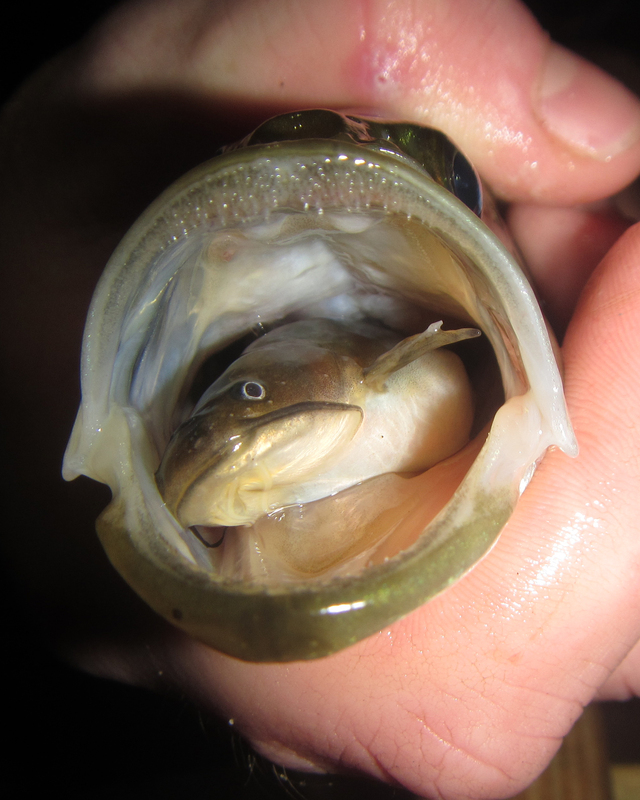 In the video above, a Largemouth Bass regurgitated a 6” green plastic fishing lure. Actually, this was the only fishing lure that we saw after pumping the stomachs of around 350 Largemouth Bass’ stomachs. More commonly, we’ll see small bluegill, perch, minnows, bullhead, or invertebrates like caddisflies or dragonflies. The diversity of food sources gives us an idea of what food sources the fish have available. Of course, not all food items are created equally. Just like you would rather eat a nice New York strip than a bag of Cheetos, fish gain more energy from certain food items. Per weight, eating a fish is much more advantageous than zooplankton or mussels. Shells and undigestible casings are wasted space, while the muscle in other fish contains valuable protein. By analyzing their diets, we can start to understand why fish in some lakes grow more quickly than fish in others. 3) I love fishing with plastic frog-shaped lures skipped across the surface of the lily pads. However, we only saw one or two frogs in the fish’s guts! One frog was too long for the 18” bass to get all the way down. Its feet were sticking out looking like he was alive five minutes ago, while the front half looked to have been digesting for a long, long time. Largemouth Bass rarely eat panfish as large as this one. Photo credit to Zak Kranich (Oamoutdoors.com). 2) Crayfish are one of the favorite prey items for Largemouth. We generally knew when a crayfish was going to come up in the gut contents, because telltale antennae were sticking out of the fish’s esophagus. We definitely knew that a crayfish had come up once the smell hit us. For those of you that eat crabs or lobster, imagine having left the shells sit in your garage for a hot summer month and you are close to the smell of regurgitated crayfish. 1) On two occasions, I grabbed a fish and prepared to pump its stomach. While holding the fish, I noticed that the stomach was wiggling around, THERE WAS A LIVE FISH IN THERE! We pumped the stomachs and found a live bullhead in one and a live bluegill in the other.